As many of you know, there has been a significant legal issue that our Township has been dealing with for over 3 years. That issue is the Federal case against Oakland Township regarding the Blossom Ridge Senior Development proposed at the corner of Adams and Dutton (see tab at top of page for more historical information). A Federal court requested ‘facilitation’ took place in the hopes that an agreement could be achieved eliminating the need for a trial. A proposal that involved just the Blossom Ridge parcel was not achieved, so the developer offered an option that included more than the original Blossom Ridge property. Judge Howard, the negotiation facilitator, supported the proposal and asked that the proposal be reviewed by the entire Board and made available to the public. A final decision by the Board IS REQUIRED by January 26, 2016, or the issue will go to trial in July. Specific information on the proposal has been made available to the public. The plans are available for review at the Township Hall, on the Township website, and in the two links shown below on this website. This topic has been added to the January 26 BOT meeting agenda. Agree that Oakland Township has violated Federal laws, with the resulting approval of original proposed plan and exposing Township to damages claimed by developer. Why is this important to the citizens of Oakland Township? This issue has been a divisive one in our Township for years. The consequences of making the right decision will have a long term impact on our Township. If the Board agrees with the consent judgement, it will restrict the Township in their ability to review the proposed developments being proposed on the parcel near the Church. However, the developer has demonstrated through the years that his developments are compatible with our Township, and we hope that the developer will consider any site concerns the Township raises if that is the Board’s decision. The potential financial implications of making the wrong decision by the Board are VERY SIGNIFICANT. We encourage all citizens concerned about this issue to visit the Township Hall prior to January 26th and review the proposed plans. After viewing the plans, make your views known by either attending the January 26th meeting, or sending a letter to the Board members. This entry was posted in Board of Trustees, Board vs. Blossom Ridge, Legal Problems, Planning and Zoning and tagged Blossom RIdge, Board of Trustees, Federal Government, Federal investigation, oakland township, Oakland Township Board, United States Department of Housing and Urban Development on January 13, 2016 by richardjmichalski. As many of you are aware, there has been a legal dispute between Oakland Township and the Clinton River Watershed Council regarding the lack of water flowing down the millrace that leads to the Paint Creek Cider Mill. On October 6, 2015 an agreement was reached between the parties. A copy of the agreement is attached to this post. Some of the key items in the agreement are spelled out in this article. 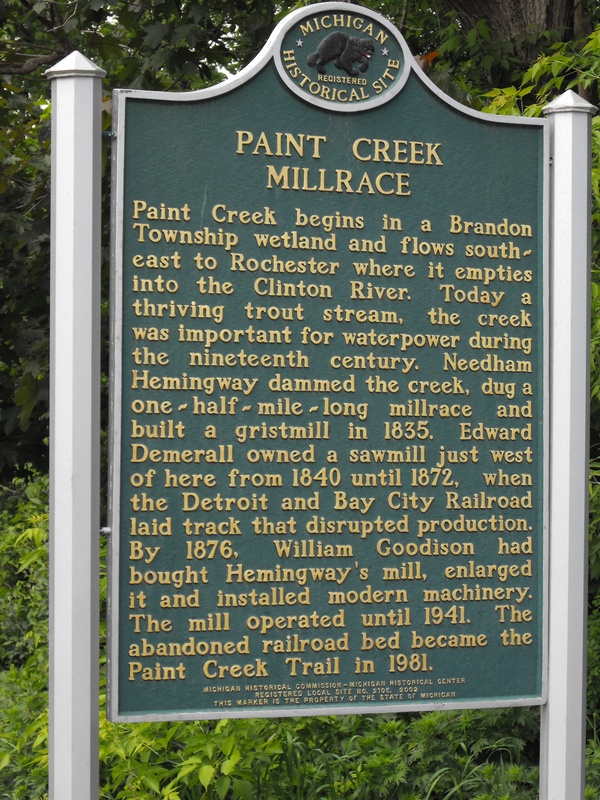 When the dam that was upstream of the Paint Creek cider mill (and the millrace) was removed in 2012, the flow of water down the millrace had stopped. The dam removal was an initiative of the Michigan Department of Natural Resources. The Clinton River Watershed Council was the fiduciary on the Great Lakes Restoration Initiative funded by EPA. 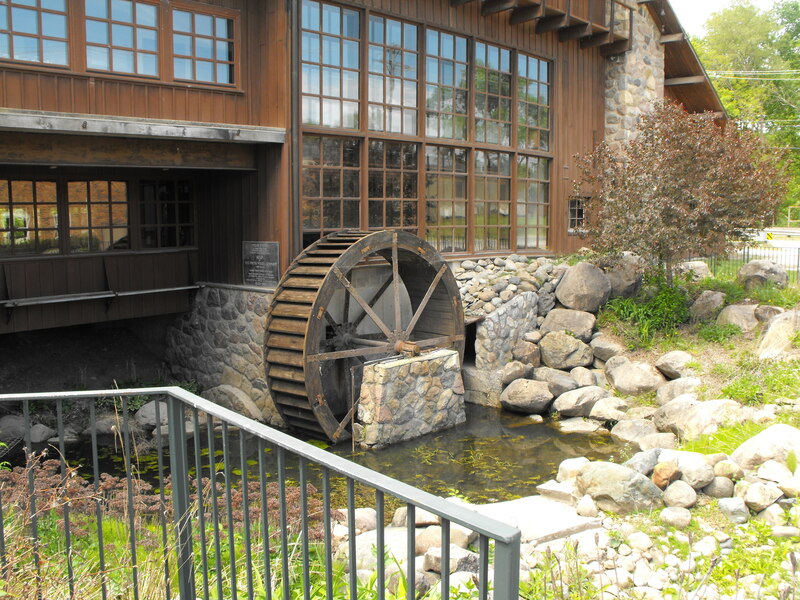 The millrace property is owned by the Township and 7 property owners. The lack of water flow in the millrace was a political issue in the 2012 elections, since the previous Board had agreed to the dam removal. The property owners asked the new Township Board members to help them get the water flowing again in the millrace because their property values had been negatively impacted. The Board has been working on this issue for 3 years. In 2014, a breach of contract lawsuit was filed against the Clinton River Watershed Council. Additional background information can be seen in the attached ‘Mutual Release and Settlement Agreement’. The Parties have agreed to settle their disputes and all related claims without further litigation. Hubble, Roth & Clark, Inc. (an Engineering Consulting firm) has determined that certain of the structures that are part of the Project (the original dam removal project) might be modified to increase the flow of water from the Paint Creek through the millrace, and possibly meet Oakland Township’s expectations of flows following completion of the Project. The Clinton River Watershed Council (through Hubble Roth & Clark) will undertake a further design/construction review. The review (or Memorandum) will include articulating the flows Oakland Township desires and identifying modifications that may achieve those flows and may be acceptable to the MDEQ/MDNR. The Design review is to be complete within 60 days. If the Parties agree upon and approve the Modifications, Clinton River Watershed Council shall facilitate a meeting with MDEQ and any other necessary governmental agencies to review the modifications, if needed. Oakland Township shall be solely reponsible for seeking agency approval of the Modifications. Within the next 12 months, the Clinton River Watershed Council will seek to identify 2 grants for the clean-out and restoration to the millrace by Oakland Township, if available and eligible. Clinton River Watershed Council shall be solely responsible for any and all costs and expenses, of any kind, nature or type whatsoever, associated with the consultant(s) review. Oakland Township shall be responsible for all costs and/or fees associated with MDEQ and/or other governmental agency review of proposed Modifications; any plans necessary for implementation of the Modifications; any design or analysis over and above that provided in the Memorandum; permitting, and any other additional pre-construction, construction or post-construction costs incurred, or to be incurred, should Oakland Township move forward to undertake to perform any Modifications; and any additional or further cost or attorney fees which may be incurred by Oakland Township. The agreement also includes the typical legal ‘boiler plate’ wording. It is clear, based on the agreement, that as we proceed with this effort, additional expenses will be incurred by the Township. Why is this important to the citizens of Oakland Township? The millrace issue has been a divisive issue in our Township for several years. The lack of water flowing down the millrace appears to be due to several things. The fundamental reason is the loss of elevation of the water feeding the millrace due to the dam removal. Another reason is that the sediment buildup in the millrace, after years of operation, prevent the water from flowing ‘uphill’. The sediment issue was raised many times by the Clinton River Watershed Council prior to the dam removal, but nothing was ever done about it. The settlement agreement appears to be a fair and equitable one. Regarding the sediment in the millrace, the millrace is used by our community for storm water drainage from the basin on the northeast side of Orion Road in front of Baldwin Elementary School. That water has contributed (in part) to the sediment buildup in the millrace. As a result, the community does have some responsibility to clear the millrace. available grant funding for the dredging & clean out of the millrace. These are three significant hurdles. It appears we now have a plan that MAY get us water in the millrace. The real test will come if the Township Board must make a decision to use public funds to remediate the problem, created on private property (no water in the millrace), as a result of the decision made by the previous Board to remove the dam. This entry was posted in Board of Trustees, Board split?, Legal Problems, Supervisor Gonser and tagged Board of Trustees, Clinton River Watershed Council, oakland township, Oakland Township Board, Oakland Township Board split, Paint Creek Millrace on October 11, 2015 by richardjmichalski. Since Supervisor Gonser and the new Board took office in 2012, the legal expense for our Township has doubled. Shortly after being elected, the Board changed law firms. 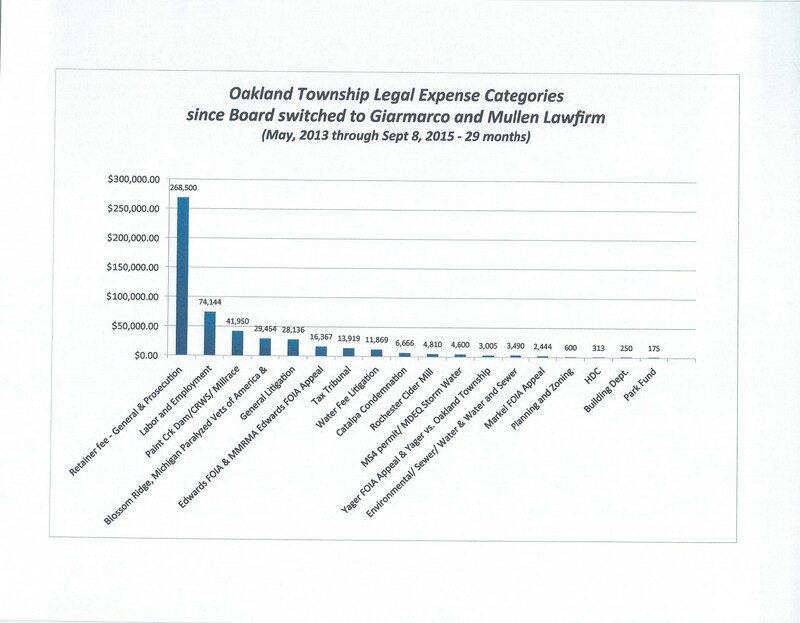 In the 29 months that the new law firm has served the Township, our cumulative legal expense is at $513,000. The legal expense for 29 months under the previous Board was approximately $255,000. So in 29 months, we have spent $258,000 more than the previous Board. An analysis was undertaken to determine the reasons for the increase. A video has been created that shows the results of that analysis, as well as some conclusions and recommendations. It is rather long, but it gives the detailed background for the conclusions and recommendations. – The primary reason for Township’s legal expense doubling is labor negotiations, employment issues and litigation costs. – The Township Board is directly responsible for many of the labor, employment and litigation costs. – Questions exist over Gonser’s authority and justification for increasing the retainer fee without disclosure to fellow Board members or citizens. – Township published records make it impossible to understand the reasons for litigation costs without using the FOIA process. – The Supervisor and the Board need to change their behavior to eliminate what some considered a “hostile environment” that warranted efforts to form unions. – The Board needs to understand the total cost (legal and associated) before making litigious decisions. – Supervisor Gonser should explain why he increased the retainer fee from $90k to $108k per year without Board approval or citizen knowledge. Why is this important to the citizens of Oakland Township? 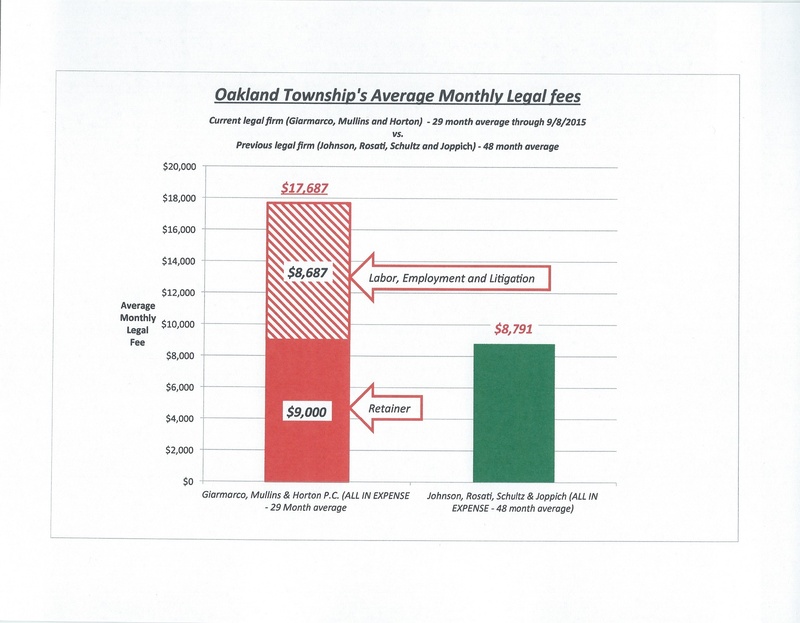 Each taxpayer in Oakland Township is now paying twice as much for legal services than they did a few years ago. This Board ran on a platform of fiscal responsibility, yet they have not questioned the reasons for the higher expense. Their actions have actually contributed to the higher costs. Most notably the expense incurred as a result of creating a work environment that drove the unionization of some of our Township staff. The Oakland Township Watcher website raised the issue of high legal expense earlier this year. It was only after we raised the concern, that the Treasurer and/or Clerk discovered an accounting error that resulted in the Township inappropriately paying for legal services that should have been charged to developer’s escrow accounts. That action will save our Township $9,000 per year. It appears our elected officials ran on a platform of fiscal responsibility and transparency, but when it comes to doing the work, citizen involvement is necessary to make sure they do what they said they would do. As the Board considers the tax rate that we will be paying next year, lowering the tax rate is only one element of fiscal responsibility. Controlling costs is the other element. Behavior needs to change and questions need to be asked and answered. This entry was posted in A new kind of "Transparency", Board of Trustees, Legal Problems, Supervisor Gonser and tagged Board of Trustees, Gonser, legal expense, oakland township, Oakland Township Board, Supervisor Gonser, Supervisor Terry Gonser, Terry Gonser, Transparency on September 19, 2015 by richardjmichalski. Please attend the Wednesday September 9, 2015 Parks and Recreation Commission meeting that will be held at 7 pm at the Township Hall on Collins Road. The Commission will be considering a motion to censure Commissioner Ann Marie Rogers for a breach of ethical and honorable behavior. Citizen support is needed if we want to maintain ethical behavior in our elected officials. It is hoped that the Commission will move this agenda item near the beginning of the meeting. As previously reported on this website, it was discovered that Park’s and Recreation Commission member, Ann Marie Rogers, as well as former Trustee Maureen Thalmann had shared privileged and confidential material with others. The findings were forwarded to the Oakland County Sheriff’s Office and Prosecutor’s office to determine if any illegal actions had taken place. Their investigation determined that no criminal actions had taken place. Rogers noted she was never asked to sign an agreement stating she not share attorney-client communications following her 2012 election to the board. It appears Ann Marie Rogers believes since sharing of privileged and confidential material was not illegal, it was not wrong or improper behavior. It appears that others on the Parks and Recreation Commission may think otherwise, and may be censuring her for her actions. The Parks and Recreation Commission will be considering officially censuring Ann Marie Rogers’ behavior. The Township Board had previously passed a similar resolution indicating that sharing of Privileged and Confidential material was “breach of trust” and that a failure to report an unauthorized receipt of correspondence marked Privileged and Confidential was ‘improper”. Why is this important to the citizens of Oakland Township? Oakland Township has now established a new standard for ethics in government. Sharing of information marked ‘Privileged and Confidential’ will now become the acceptable standard for elected officials – unless the Park’s and Recreation Commission make it clear that such behavior is unacceptable. An individual’s moral values are the basis for one’s behavior. Ethical behavior is therefore in the “eyes of the beholder”. Laws are written to protect society from significant unethical behavior. Laws do not restrict ALL unethical behavior. Sharing Privileged and Confidential material has now been determined not to be illegal or criminal, and, in the eyes of one of our elected Parks Commissioners, acceptable. The issue of whether the information HAD been shared by the two elected officials was never contested. The issue the Sheriff and Prosecutor had to determine was whether sharing the information constituted a criminal act. To be clear, the prosecutor DID find that Ann Marie Rogers did not commit a crime. However, they DID NOT conclude, as Ann Marie stated to the Oakland Press, that there was not ANY ‘improper’ behavior. It appears her value system is based on only following the laws on the books. The Park’s and Recreation motion will parallel a similar motion the Township Board took following Maureen Thalmann’s actions and the County’s findings. Both actions will make it clear to our elected officials that sharing of Privileged and Confidential material IS considered a breach of ethics and honorable conduct in our Township. This entry was posted in Ethics, Legal Problems and tagged Ann Marie Rogers, Oakland Township Parks, Parks and Recreation, Unprofessional behavior on September 8, 2015 by richardjmichalski. The Oakland Township Board of Trustees, at their July 28th meeting, voted 6-0 (Gonser absent) to approve a resolution stating “There has been an inappropriate release of privileged and confidential and/or Attorney/Client protected communications which constitutes a Breach of Trust and is hereby repudiated.” and further “It is improper to fail to disclose any unauthorized receipt of privileged communications prior to entering deliberations pertaining to matters discussed in the communications.”. Trustee Thalmann had sent three emails pertaining to Parks Commission or Board of Trustee Closed Sessions or containing Attorney/Client privileged communications to (variously) Commissioner Rogers, Supervisor Gonser and/or unauthorized private citizens. Thalmann had received two emails from Commissioner Rogers pertaining to Parks Commission Closed Sessions or containing Attorney/Client privileged communications. Commissioner Rogers sent six emails pertaining to Parks Commission Closed Sessions or containing Attorney/Client privileged communications to (variously) Trustee Thalmann, Supervisor Gonser and/or unauthorized private citizens. The Parks Commission and the Board of Trustees reviewed these findings at a April 28th 2015 joint meeting and forwarded them to the Oakland County Prosecutor. The Prosecutor’s office reported back on July 15th 2015 that “no basis exists for criminal prosecution and…no laws have been violated.”. Commissioner Rogers and former Trustee Thalmann, who had resigned during this time period, each stated in various public meetings that they had done nothing wrong, were totally exonerated and were owed apologies. They did not dispute the findings of the investigation that they had violated Attorney/Client Confidentiality and Privilege. They dismissed that as unimportant. The Board of Trustees felt that, criminal or not, the behavior was improper and important and called for Board action which was taken with the 7/28/15 Resolution. What are we to think about this? The attorney-client privilege is the oldest privilege recognized by Anglo-American jurisprudence. In fact, the principles of the testimonial privilege may be traced all the way back to the Roman Republic, and its use was firmly established in English law as early as the reign of Elizabeth I in the 16th century. Grounded in the concept of honor, the privilege worked to bar any testimony by the attorney against the client. A legal concept grounded in honor that has been fundamental to jurisprudence in Western Civilization for over five hundred years deserves our respect. Public Officials, elected by the people, cannot act as though it does not apply to them. Perhaps these breaches of trust had their origin in the leadership, People who lead an organization have the responsibility to set an example for the practice of strong ethics. Gonser did not inform the Board that he had improperly received protected communications about matters which were immediately important to him. Also, Supervisor Gonser had, until recently, refused to abide by the Township’s Ordinance 97 which limits the elected Supervisor’s authority with regard to conducting Township business. He made many decisions and did many things for which he had no authority. In conversation with me last Spring he explained himself saying that he was elected by people who don’t know that the Supervisor’s power is limited and that they expect him to “be the leader of the Township” and that they didn’t elect him “just to chair meetings and ride in parades”. Rogers and Thalmann may have just been following a bad example. Taking another step up the chain of responsibility, lets look at ourselves, the voters. We elected Rogers, Thalmann and Gonser either by voting in the 2012 August Primary or by not showing up. At that time the Township had over 12 thousand registered voters. How many votes did it take for these people to get elected? Rogers – 1315 votes -11% of the electorate. The August 2016 Primary Election is 12 months away. It is an important election because, in Oakland Township, for whatever reason, our local elections seldom attract Democrat candidates, so the November Elections for Local Offices are not competitive contests. Our Local elections are decided in August. Let’s learn from these events. Get active, Get informed, Get on the Ballot, Get to know the Candidates and Get Out The Vote in August. This entry was posted in Board of Trustees, Board vs. Parks, Ethics, Legal Problems, Supervisor Gonser and tagged Abuse of Power, Ann Marie Rogers, Board of Trustees, Board vs. Parks on August 5, 2015 by foulkrj. As previously reported, the Township Board requested the Planning Commission review and develop potential zoning ordinance changes for the Board to consider regarding the control of gas and oil drilling sites in Oakland Township. The Board also put in place a six month moratorium on new oil and gas drilling sites while the Planning Commission and Board potentially take action. The Planning Commission will begin their efforts on this request at the August 5, 2015 Planning Commission meeting. Township Supervisor Terry Gonser, who, along with trustee John Giannangeli, was absent from the (July 14th) meeting and did not cast a vote in the matter, said he is not in favor of addressing oil and gas exploration at the township level because of state laws regulating the act. Why is this important to the citizens of Oakland Township? Concerned citizens should try to attend the August 5, 2015 Planning Commission meeting and voice their support for having the Township take advantage of neighboring communities learnings regarding oil and gas drilling sites. The Planning Commission meeting starts at 7 PM, and is held at the Oakland Township Hall on Collins Road. It is disappointing that Supervisor Gonser is satisfied relying on the State to ‘regulate’ oil and gas drilling in Oakland Township when several of our neighboring communities have put in place a limited level of local protection for their communities. Why would one of our elected officials not try to similarly protect us? I guess the Supervisor’s conservative values concerning individual property rights, big government intervention and regulations also applies to local government regulations, even if those local regulations would protect our residents. The ‘balanced’ approach that Trustee Ferriolo describes in the Oakland Press article is the more appropriate approach to protecting everyone’s individual property rights. JUNE 17th UPDATE: Is Drilling for Oil and Gas coming to Oakland Township? Is Drilling for Oil and Gas coming to Oakland Township? This entry was posted in Board split?, Legal Problems, Planning and Zoning, Supervisor Gonser, Tea Party ideology and tagged Board of Trustees, Gonser, oakland township, Oil and Gas drilling in Oakland Township, Planning and Zoning in Oakland Township, Supervisor Gonser, Supervisor Terry Gonser, Terry Gonser on August 5, 2015 by richardjmichalski. At the July 28, 2015 Oakland Township Board meeting, the Board revised the contract with the Township’s legal firm, Giarmarco, Mullins and Horton P. C. The monthly retainer fee was reduced by $750. Treasurer Langlois stated the reduction was done for a ‘more proper’ allocation of expenses regarding legal services. Trustee Bailey indicated that there were some legal service fees that were put ‘erroneously’ into the General fund that should have been billed to ‘other people’. The change to the contract is welcomed. As previously reported on this website, the legal service fees for our Township have almost doubled since the new Board was elected in 2012. This recently discovered error explains a portion of the reason for the higher expenditure, but does raise several questions regarding whether the Township has been subsidizing developers, and whether we can retroactively recover those costs. The Board also missed an opportunity to clarify an issue that had been repeated raised by former Trustee Thalmann regarding ‘double coverage’ for legal services for the Parks and Recreation Commission. Have all the charges that should have been charged to the developer’s escrow funds been identified? If they have been identified, have they been correctly charged to those accounts? If they have not been identified, will they be identified? If not, have the Township citizens essentially been subsidizing the developers? Are there other consultant fees, beyond the legal fees, that have improperly been charged to the Township? The Board did not respond to any of the questions raised. The author also pointed out a missed opportunity to clarify an issue regarding the legal fees for the Parks and Recreation Commission. Former Trustee Thalmann repeatedly complained that the legal retainer fee includes legal support for the Park’s Commission, but that the Parks Commission continues to use Joppich’s firm resulting in double payment for services. The Board members never corrected her repeated claims. As a result, the citizens were left to believe that the monthly retainer fee WAS intended to cover the Parks Commission. Based on that assumption, an analysis was undertaken to look at the historical expense for legal fees for the Parks and Recreation Commission prior to the Board changing law firms. The six year average for Parks and Recreation legal services, prior to this Board taking office, was approximately $5,000 per year. As a result, the monthly retainer fee with Giarmarco, Mullens & Horton, P.C. should be further reduced by $416 per month, or $5,000 for the year, to reflect that they are not providing Park’s Commission legal support. Once again, the Board refused to respond to the question and suggestion. Here is a video of Treasurer Langlois and Trustee Bailey’s comments at the meeting. Why is this important to the citizens of Oakland Township? 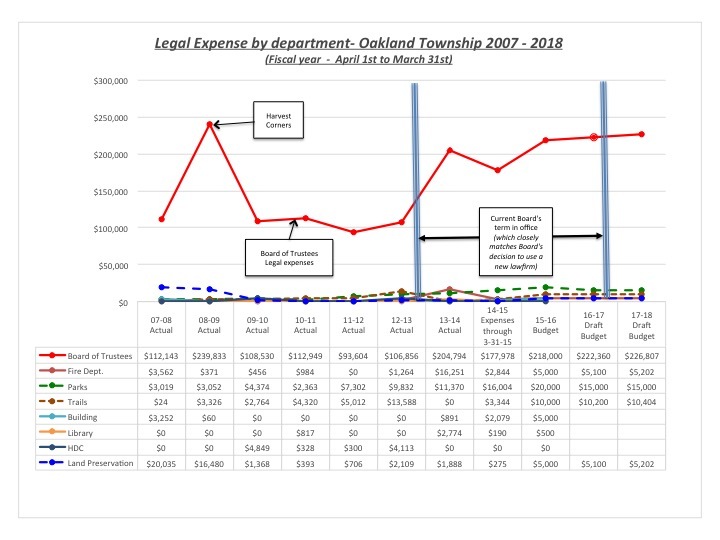 As previously reported, the legal expense for our Township has almost doubled since the current Board took office. The following graph shows this historical and projected trend. The recent discovery, that we have not been charging developer’s escrow funds for legal services, is a direct result of the inquiries raised on this website. The Board needs to address the questions raised in THIS posting, so the citizens understand how much we may have subsidized developers and if the fees can retroactively be recovered. They also need to clarify whether the retainer fee is intended to cover Parks and Recreation legal support, as had previously been claimed by former Trustee Thalmann, and not challenged by the Board. There are a number of other financial ‘transparency’ issues that will be brought up in later posts. The Board still needs to make a case for why legal service fees have almost doubled during their tenure. Attorney bills out of control in Oakland Township? July 14th UPDATE: Attorney bills out of control in Oakland Township? Accounting error found! This entry was posted in A new kind of "Transparency", Board of Trustees, Board vs. Parks, Legal Problems and tagged Jeanne Langlois, Mike Bailey, Misappropriation of funds, Misuse of funds, oakland township, Oakland Township Board, Transparency on August 2, 2015 by richardjmichalski.